I see that French President and crook Jacques Chirac has called for international aid to the Palestinians to continue despite the recent election victory of Hamas. Chirac has said that the World Bank should set up a fund to pay the salaries of Palestinian officials. So, despite the chilling blood thirsty nature of the terroristic Hamas, Chirac wants to ensure that they are generously funded to keep up their mission to...er...kill those nasty Jews. John Hume destroyed his own Party in pursuance of his own megalomaniacal vision of legitimising Sinn Fein. Sinn Fein now dominates and the SDLP are increasingly an utter political irrelevance, as the next election results will assuredly prove. What does it profit a man if he gains a United Ireland and loses or forfeits his own political party? Regular readers will know that I have been advocating the sustained bombing o f Iranian nuclear facilities for some time, as I do not believe for one nano-second that the so-called "negotiations" favoured by much of our political elite today will achieve anything more than did those with North Korea! Today, I see that Rod Liddle, writing in the Sunday Times, thinks similarly when he explains that ..
Liddle argues that we should still TRY to negotiate even though it will most likely fail. He argues we should TRY sanctions, even though they will most likely fail. He suggests we should TRY bribing the Mullahs - knowing that will not deflect them in their quest for Nukes. I say, forget all about "quite soon" and send in the Planes right now. The Mullah's nuclear dreams will become all our nightmares if we don't waken up to the threat they pose. IRA RESPONSIBLE FOR IRA DEATHS.. So, who is lying, IRA leader Gerry Adams or former Priest Denis Bradley? The latter alleges that Margaret Thatcher offered a compromise deal that would have ended the 1981 hunger strike early and saved six of the remaining prisoners who went on to die. Bradley was the man who maintained a secret link between successive British governments and the Provisionals. Bradley claims that the IRA leadership had been handed a deal in early July 1981 - which eventually the prisoners did accept, but only after six more of their comrades had starved to death. Bradley's account contradicts claims by loyal supporters of Gerry Adams that there had been no offer on the table in July that could have ended the hunger strike after four prisoners died. Richard O'Rawe, the IRA's spokesman in the H-Blocks at the time of the hunger strike, said Bradley's recollection of a deal endorsed by Thatcher bolstered his own claim that the external republican leadership vetoed the compromise for electoral gains. So, it appears clert it was the IRA leadership outside the Maze Prison who ensured six human sacrifices were made for their cause, when these lives could have been saved. That said, Thatcher should NOT, under any circumstances, have offered ANY face-saving compromises. If the IRA wanted to kill themselves, one by one, surely that was THEIR human right? Wow- like, how RADICAL is that, maaan? Yea - we're bringing down the system. Betcha Rolling Stone is against the Iraq war? Yes. And, betcha they're in favour of "Green Politics"? Yes. Indeed this lot are are so predictable that their alleged "anti-establishmentism" is part of ...erm..the establisment! I'm with Frank Zappa when he memorably observed that "rock journalism is people who can't write interviewing people who can't talk for people who can't read." Now that was anti-establishment! LORD VICHY SAYS NO SURRENDER. David Trimble can always be relied upon for a laugh. I see that he has forecast that Northern Ireland will not have a power-sharing executive by the November deadline set by the Irish and British governments. The Nobel Laureate and former UUP leader has accused British Prime Minister Tony Blair of threatening unionists and ignoring the failings of republicans when he launched the blueprint to restore devolution. So far so good. Of course Unionists are being threatened by Blair and his stooge Hain, and of course the same rotten Government turns a blind eye to ongoing Republican criminality. But Trimble then spoils it all by proclaiming that the DUP lacks the "moral courage" to go into Government with the IRA's proxies!!! Sorry, but maybe in Lord Vichy's strange world moral courage is turned on its head, but in MY world, refusing to enter an Administration with the bloodthirsty barbarians of the IRA is a mark of courage and a defence of morality. So, once again, poor Mr. T calls it wrong. 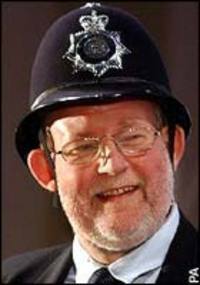 You have to feel sorry for the lady who, having been dragged from the street and raped at knifepoint by a foreign criminal freed from jail, has rightly called on Charles Clarke, the bumbling halfwit Home Secretary, to resign. Her attacker was allowed to go free by immigration officials who could have deported him after he finished serving a three-year jail term for robbery. The 40-year-old mother, who has been mentally scarred by the ordeal and has undergone intensive counselling, said her attacker “did not deserve to be alive”. She was attacked in her home city of Sheffield by Abdulrahmam Osman, a 31-year-old Somali, (A Somali, what a surprise!) after he had been released from a jail sentence for robbery. Osman, who has a string of previous convictions, held a knife to her throat, dragged her into bushes and raped her. If Clarke had ANY integrity he would go, in God's name, and go now. He hasn't - but will the media storm bring him down? I see that Rolling Stone Keith Richards has suffered a mild concussion while vacationing in Fiji and was flown to a New Zealand hospital for treatment. Media reports said Richards fell out of a palm tree and remained hospitalised in Auckland. Now what on earth was he doing UP a palm Tree at his age? Well done Keith! Did you read that "Call me Dave Cameron", the uberliberal leader of the British Conservative Party, is not quite as green as he portrays himself? 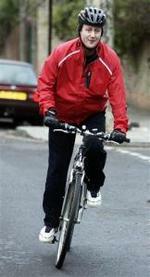 You must have seen all those images of thoroughly modern young Dave boldly cycling to work each day, in a public display of his green credentials and his genuine desire to save the planet. However it turns out that as Dave wheels along dreaming of new taxes to introduce and new PR shots to conjure up, his DRIVER loyally chugs behind him in the tax-payer funded Lexus, carrying his Master's case, shirt and shoes. If the Conservatives realy think that this grinning PR spiv is going to lead them into victory with his shallow agenda for aping Blair then they do not deserve the support of the British people. THE RETURN OF THE COMMUNISTS.. There was much delight amongst the European Left, and jubilation in the Euro MSM, when Romani Prodi scraped home to win the Italian election by the narrowest of margins. Now we see that a former hardline Communist, Fausto Bertinotti, has been elected to be the speaker of the lower house, the Chamber of Deputies. Apparently Bertinotti's supporters love him for continuing the proud tradition of waving the hammer and sickle in a country that, during the Cold War, was home to the West's biggest communist party. I think we can all work out why the media were so encouraged to see Prodi back in power. The Communism enablers are on the way back - dressed in expensive, fashionable and expensive clothes, of course.